Montefiore and Einstein are key members of an international consortium of academic research institutions that have been awarded a $21 million grant from the National Institutes of Health (NIH) to develop better ways to prevent the development of epilepsy following traumatic brain injuries. The research at Montefiore and Einstein will be led by Solomon Moshé, MD and Aristea Galanopoulou, MD, Ph.D. The grant involves seven principal investigators at five institutions. 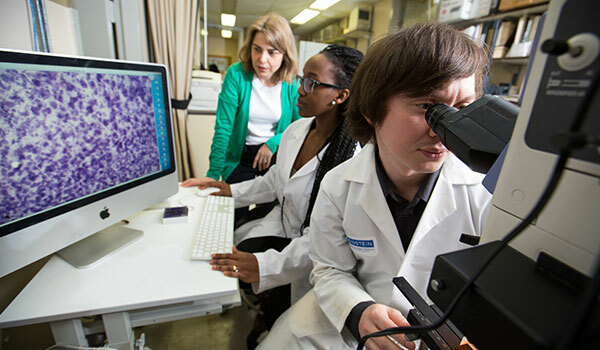 In addition to Einstein, researchers at David Geffen School of Medicine at UCLA, University of Southern California Laboratory of Neuro Imaging, University of Melbourne and University of Eastern Finland will collaborate in the fields of bioinformatics, molecular biology, cellular pathology, therapy discovery and the health sciences to prevent the onset of epilepsy. The research team will identify biomarkers associated with the development of epilepsy and develop novel therapies designed to prevent or modify the condition, which is currently incurable. They will also engage with patients and their families to help identify their most pressing needs and concerns, encourage them to participate in research, and provide educational resources. The project, the Epilepsy Bioinformatics Study for Antiepileptogenic Therapy, or EpiBioS4Rx, includes an international network of 13 centers for traumatic brain injuries and seven preclinical research centers with expertise in traumatic brain injury, epileptogenesis (the development of epilepsy), the identification of plasma, tissue, EEG, and imaging biomarkers and preclinical therapy development. Epilepsy is a broad term used for a brain disorder that causes seizures. About 2.9 million adults and children in the United States have active epilepsy, according to the Centers for Disease Control and Prevention. About a third of those patients’ seizures are not controlled by drugs. Traumatic brain injuries are the most significant cause of epilepsy in people ages 15 to 24. For nearly four decades, Einstein has pioneered research in understanding the physiological origins of epileptic seizures and their consequences as a function of age and gender. It created novel animal models of seizures and epilepsies, which were vital in moving promising treatments into clinical practice. This approach will now be used by Einstein researchers to identify and test therapies to prevent the onset of epilepsy following traumatic brain injury. This research will be led by Dr. Galanopoulou, professor in the Saul R. Korey Department of Neurology and the Dominick P. Purpura Department of Neuroscience. “There is currently no effective treatment that can prevent epilepsy. Our consortium is planning to conduct the first international, multicenter collaborative preclinical study aiming to identify new therapies that prevent the development of epilepsy after traumatic brain injury. Successful treatments will therefore have the potential to transform the way we treat those affected by traumatic brain injuries” says Dr. Galanopoulou, who is co-principal investigator on the grant at Einstein. Dr. Moshé, Einstein co-principal investigator, will lead the community engagement core. Tapping into Montefiore Health System’s Comprehensive Epilepsy Center, Dr. Moshé will recruit patients to join the grant as advisors. The patients will help determine the direction, scope and measureable outcomes for any future clinical trials that will be developed as a result of the drugs identified during this grant. “Individuals with epilepsy and their families have perspectives and insights that are critical for us to determine the best possible treatments and outcomes,” says Dr. Moshé. “While we can determine physiological benchmarks and scientific biomarkers, they will prove indispensable in helping us determine the best way to improve quality of life.” Dr. Moshé is professor in the Saul R. Korey Department of Neurology, the department of pediatrics and the Dominick P. Purpura Department of Neuroscience; and director of the divisions of child neurology and clinical neurophysiology in the departments of neurology and pediatrics at Einstein and Montefiore. He also holds the Charles Frost Chair in Neurosurgery and Neurology. Additional Einstein researchers on the grant include Craig Branch, Ph.D., and Wenzhu Mowrey, Ph.D. Dr. Branch, who directs the Gruss Magnetic Resonance Research Center at Einstein, will determine the imaging biomarkers that are essential in determining if a treatment is effective. Dr. Mowrey, assistant professor of epidemiology & population health, a long-standing collaborator of Drs. Galanopoulou and Moshé in their preclinical therapy discovery studies, will advise on the statistical analyses. In addition to Drs. Moshé and Galanopoulou, the principal investigators on the grant are Jerome Engel Jr., MD, Ph.D. and Paul Vespa, MD of the David Geffen School of Medicine at UCLA; Terence O’Brien MB, BS, MD, F.R.A.C.P. of the University of Melbourne; Asla Pitkänen, MD, Ph.D. of the University of Eastern Finland; and Arthur Toga, Ph.D. of the Keck School of Medicine at the University of Southern California. The grant was awarded by the National Institute of Neurological Disorders and Stroke, part of the NIH (1U54NS100064).